Double Draw Tarot Bags - Hopes & Wishes Double Draw Bag - Tarot Bags, Tarot Cards, Cloths, & More! 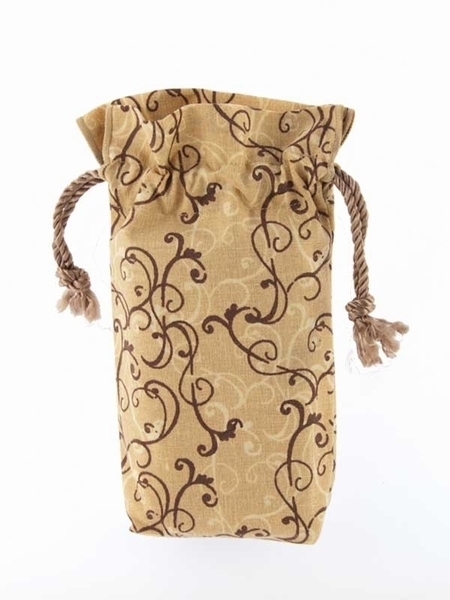 Elegant brown toned filigree designs grace this pale golden tan fabric of this Tarot bag. The neutral tones make this bag an ideal companion to the many Old World style Tarot cards, especially those decks whose backs and borders have similar designs. Bag Design: Our double draw bags feature a two cord drawstring top that creates a 1 inch ruffle when pulled closed. The drawstrings are high-quality decorator's cord. The bottom of the bag is slightly squared off (gusseted) to better fit a deck of cards. It even fits some standard decks in their boxes! Size: Measures about 5" wide by 7-1/2" long (approx. 13 cm x 19 cm). Fits most card decks that are 3-1/4" by 5-1/2" and less.